Our guest speaker this week was our newest member Amin Patham. 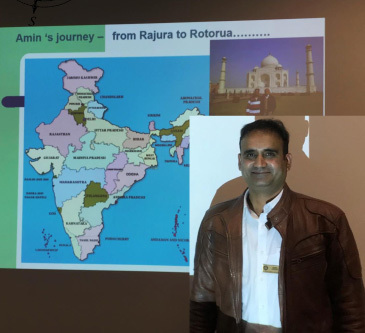 He took us on a wonderful journey in pictures & maps, from his birthplace in India to his work in Rotorua. His parents had hoped he would become a doctor. Instead, he married his secret love and become an expert Crop Protection Incursion Investigator, working on projects like the dreaded Myrtle Rust.